BA Suarti Woven Wheat 18” 925 Sterling Silver Chain 8” Inch Bracelet Set. Condition is Pre-owned. Shipped with USPS Priority Mail Small Flat Rate Box. Wholesale Listing EVERY SIZE AVAILABLE 14" to 36"
POLISHED BASKET WEAVE /BOLD WHEAT (?). IT HAS AN OVERSIZED SPRING RING CLASP. CHAIN BRACELET 7 1/4 LENGTH. The ends are 14k yellow gold. NICE easy clasp! Great quality. Stamped "D.Y", "585" (14k) and "925" (sterling silver). This is a pre-owned item. Could use a polishing. Piece is signed and stamped on the ends of the bracelet. 2.15 mm Oxidized Wheat Chain.925 Sterling Silver from Italy. Lobster Clasp. A wonderful chain that can be worn alone or add a pendant. Material: . 925 Sterling Silver Oxidized. Lobster Clasp: 11mm. Ending Monday at 1:04PM PDT1d 8hTop Rated PlusMetal: Sterling SilverLength: 30 - 35"
Sterling Silver 1.5mm Diamond Cut SPIGA WHEAT Chain Necklace 925 Italy 16-30"
Weight 5.1 grams. Width 1.8mm. Made in Italy.The lesson about Italian jewelry. 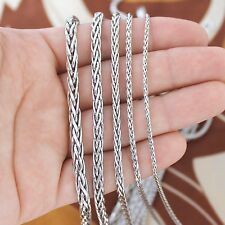 Long Vintage Sterling Silver Wheat Chain Necklace 25"
Wheat Style Chain. Necklace Chain. with box lobster claw clasp. Clasp type Sterling Silver.925 Sterling Silver. Chain type Choose Width. 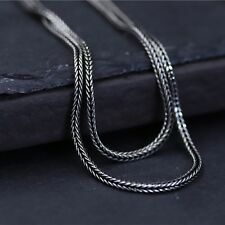 925 Sterling Silver Wheat Chain Necklace Bali Neclace 1.5mm 16 18 20 22 24 26"
Chain Style: Adjustable Spiga wheat chain. Thickness: 2mm (030 gauge). Stamped 925. Lobster claw clasp. Chain Details Ball with silicone inside to hold chain at the desired length. LORI BONN Heavy Sterling Silver Double Wheat Chain Necklace 17"
Very nice sterling silver double wheat chain necklace, marked LORI BONN 925. Classic John Hardy 23" wheat necklace made of sterling silver. If you have never seen one of these in person, the chain itself is oval in shape, and the longer side lies flat against the neck. Weight is a hefty 78 grams. This is Pure Sterling Silver. NOT hollow! NOT silver plated! Length includes clasp. Heavy Gold Plate over. 925 Sterling Silver. Weight 7.6 grams. Width 1.8 mm. Made in Italy.The lesson about Italian jewelry. 925 Sterling Silver. Net proceeds from the sale of these goods and financial donations from the community make it possible for us to operate our free job training programs. 2.1/8" Drop. Any item sold by the Seattle Goodwill is eligible for local pick up at our warehouse. 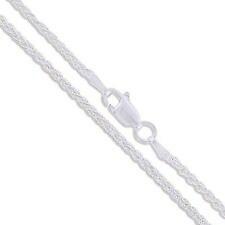 2.15 mm Oxidized Wheat Chain.925 Sterling Silver from Italy. Lobster Clasp. A wonderful chain that can be worn alone or add a pendant. Stamped 925. Material: . 925 Sterling Silver Oxidized. Lobster Clasp: 11mm. Lobster Claw clasp. Pendant is approx. chain is 6 gauge (4mm) thickness. In good condition JAMES AVERY .925 wheat / spiga styled chain good used condition 16" long. Condition is Pre-owned. Shipped with USPS First Class Package. Ending Wednesday at 7:42PM PDT3d 15hMetal: Sterling SilverStyle: ChainLength: 16 - 17.99"
It is in excellent condition and will be shipped safely and securely. Payment is expected within 2 days of purchase, unless prior approval has been received. I am a registered business so Texas residents will be charged sales tax. 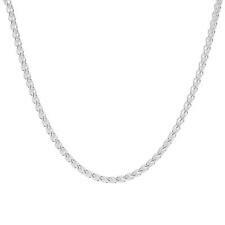 925 Sterling Silver Wheat Chain Necklace 24"
2mm Sterling Silver wheat chain, 20". Made in Italy. Lovely wheat pattern. Generations of heirlooms in these wonderful boxes! It's a treasure hunt in gem land! I was surprised to find the safe it wasn't noticeable till we emptied the closet. NO EXCEPTIONS! BEAUTIFUL PIECE. David Yurman Sterling Silver & 14K Gold 8 MM Wheat Chain Necklace 17 3/4"